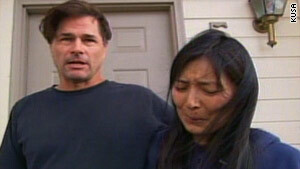 Mayumi Heene, according to court documents, said she and husband, Richard, knew their boy was not in balloon. Washington (CNN) -- The wife of a Colorado father at the center of the "balloon boy" saga told authorities that the giant helium balloon was specifically created for a hoax to draw media attention, according to court documents released Friday. Mayumi Heene told Larimer County investigators that she and her husband, Richard Heene, knew that their 6-year-old son, Falcon, was hiding at their Fort Collins home the entire time, even as police and military scrambled to search for the boy, according to the documents. The admission by Mayumi Heene was made October 17, just two days after the balloon was released, according to the documents. The Heenes initially told authorities that they believed their child had flown away on the balloon, and when the balloon landed without him, they expressed concern that he may have fallen out of the device. The couple hatched the plan about two weeks before the incident and "instructed their three children to lie to authorities as well as the media regarding this hoax," according to the documents. Their motive? To "make the Heene family more marketable for future media interests." Calls to David Lane, Richard Heene's attorney, and Lee Christian, Mayumi Heene's attorney, were not immediately returned Friday. Richard and Mayumi Heene are each facing a number of local charges, including conspiracy, contributing to the delinquency of a minor and attempting to influence a public servant, Larimer County Sheriff Jim Alderden said Sunday. Lane has said that the sheriff was overreaching and that the family deserve the presumption of innocence. The Federal Aviation Administration is also investigating the incident. Richard and Mayumi Heene met in a Hollywood acting school and pursued fame for their family in the world of reality TV, Alderden has said. The Heenes have appeared on the ABC program "Wife Swap." Richard Heene also chases storms, brings his family along and takes videos. TLC, which produces the show "Jon & Kate Plus 8," said the Heenes had "approached us months ago" about a possible show, "and we passed."